TTalk of a new South African flag design first emerged with the release of Nelson Mandela in 1990. It came at a time when the country needed change, a binding symbol of hope and freedom and a true rainbow nation indicator. It started in 1993 already, when a national competition invited the public to submit flag designs, the pressure was on to create what would become the most visible symbol of the fledgeling democracy. The new flag design was considered a vital process which happened rather quickly when a committee was tasked to come up with the perfect design with little time to spare. Led by former State Herald, Fred Brownell, the team was given one week to come up with an appropriate design. Brownell had reportedly made a few sketches the year before, while at a vexillological (flag expert) conference in Switzerland. One of these was selected by both sides of the transitional government as the preferred design. It was even sent to Nelson Mandela who was in Rustenburg at the time, to approve it by fax. This would be considered the most important approval of all. The current South African flag was only destined to be the country’s interim flag to coincide with the interim government, but was eventually assimilated as one of the official symbols of the new democracy. The South African national flag was first hoisted on 27 April 1994 when the country held its first free elections. Today, this is known as Freedom Day, and is celebrated as a public holiday on which the flag is traditionally flown. Officially, the South African flag colours do not hold any symbolism, although they have unmistakable historical origins. Black, yellow and green are the colours of ruling ANC party. Red, white and blue are a nod to both the flags of the European colonists as well as the old Boer republics. 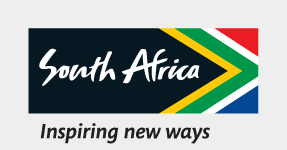 The V or Y shape, which can be interpreted as "the convergence of diverse elements within South African society, taking the road ahead in unity". The meaning of the South African flag design can be traced to the motto on the National Coat of Arms, which reads: “!ke e:/xarra //ke”, which is the Khoisan language of the /Xam people, meaning “diverse people unite”. The “Y” represents a convergence of diversity, which can be interpreted as the convergence of diverse elements within South African society taking the road ahead in unity. South Africans are proud of their colourful and symbolic flag which is easily recognised at any given international event.